Listed in: Event Coordinator category. Seema's services include two popular packages. You plan your own wedding to your desires. I will assist you only on the day of the wedding to orchestrate the photographer, florists, caterer, and band. I will begin my day when the bride takes her protraits and end at sheva brochos. I will direct the timing of the wedding and be in sync with the caterer. In addition to the coordination of the actual event as in the Silver Package, I will assist you in the planning of your wedding. I will work with florist, photographer, caterer and band to create a unified event. I will negotiate the contracts and assist you before the event as well as the entire day of the event to make your event stress free. 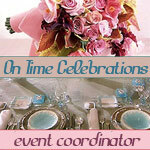 Your event will run on time for you and your guests to enjoy. Get more for your wedding! Don't forget to mention ChossonKallah.com when visiting On Time Celebrations by Seema.